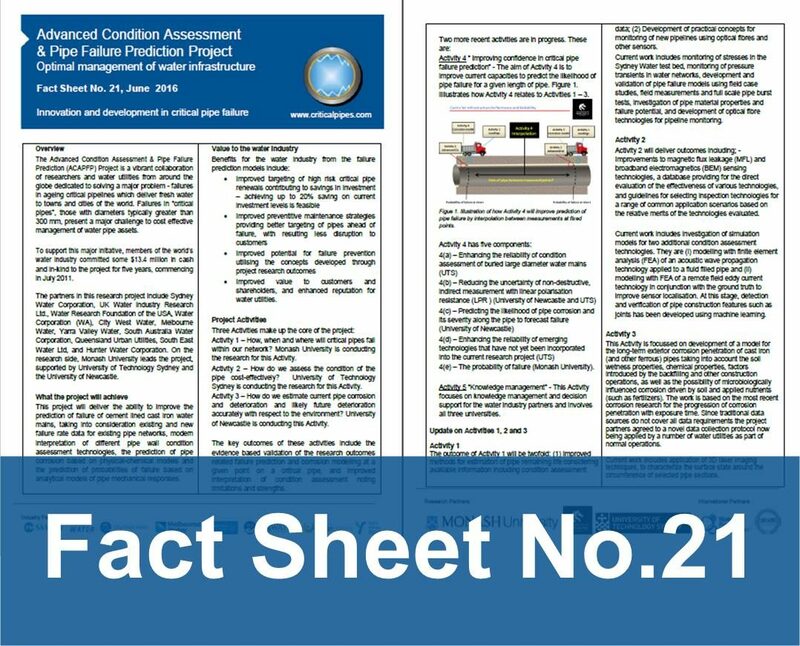 The Advanced Condition Assessment & Pipe Failure Prediction (ACAPFP) Project is a vibrant collaboration of researchers and water utilities from around the globe dedicated to solving a major problem – failures in ageing critical pipelines which deliver fresh water to towns and cities of the world. Failures in “critical pipes”, those with diameters typically greater than 300 mm, present a major challenge to cost effective management of water pipe assets. To support this major initiative, members of the world’s water industry committed some $13.4 million in cash and in-kind to the project for five years, commencing in July 2011. The partners in this research project include Sydney Water Corporation, UK Water Industry Research Ltd., Water Research Foundation of the USA, Water Corporation (WA), City West Water, Melbourne Water, Yarra Valley Water, South Australia Water Corporation, Queensland Urban Utilities, South East Water Ltd, and Hunter Water Corporation. On the research side, Monash University leads the project, supported by University of Technology Sydney and the University of Newcastle.